Tonight is another American Idol Results show – last night our the California Dreamin’ themed episode our ‘Top 4’ performed a song from bands or singers from California and the second, songs “I wish I had written” (or FREE choice). With only four singers left in the competition, each time the remaining contestants hit the stage it is crucial for them to shine and shine bright. Some of the four did that last night and some did not. After tonight we will be down to our ‘Top 3‘ If you missed last night’s show we have a full and detailed recap here. If you missed any on last night’s performances we have all the videos here. We conducted a poll today to find out who our viewers thought would be going home tonight. 60.39 % think Holly Cavanaugh will be on her way out followed by Philip Philips with 15.94% of the vote. The results are not considering Sadly, Hollie, who has been the “Dark Horse”, fell flat last night. If you have not entered our poll yet there is still time, go here! On tonight’s show special guest and former Idol 7 winner David Cook will perform his new single, “The Last Song I’ll Write For You” and Judge Jennifer Lopez will be performing that song where her boyfriend gropes her, again, “Dance Again”. RECAP: Opening up the show tonight are the top four singing one my favorite songs, “California Dreaming'” by The Mommas & the Papas. Right now Ryan Seacrest is jumping into the results, if they make it, they get the home town visit with a private jet. Phillip Phillips is up first and the crowd is going crazy. Jimmy thought that Phillip came into his own last night when he choose a saxaphone instead of an acoustic guitar for “Have You See The Rain, furthermore, with “Volcano” it was all magnificent and if Jimmy had seen that in a club, he would have singed him right away. Ryan plays with us, he tells Phillip to go sit on the couch. 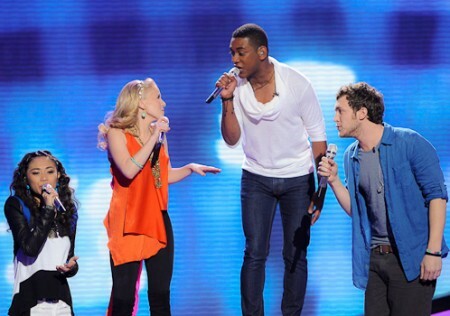 Next, it’s Hollie Cavanagh and Jimmy says that “Faithfully” worked for her last night, but “I Can’t Make You Love Me” was all wrong because she didn’t understand the core of this song, she crashed and burned. Ryan sends her to the couch as well. A little entertainment to prolong our suffering waiting to hear who is in the bottom; David Cook performs his new single, “The Last Song I’ll Write For You”. Joshua Ledet is up next to get the news. Jimmy thought “You Raise Me Up” was a not a good choice last night and let him down. Jimmy thinks Joshua’s second song, “It’s a Man’s Man’s Man’s World” was a piece of magic, so captivating and he wants to see it again and again. Joshua is sent to the couch as well. The last person called up is Jessica. Jimmy thinks that Jessica’s “trick is old” and should just leave the growl “trick” in the hat for “Steal Away”. On Jessica’s second song, “And I’m Not Telling You”, she brought everything into this song and murdered this song, it was shock and awe according to Jimmy. Ryan sits her on the couch as well, the four are all sitting together. More entertainment, Judge Jennifer Lopez performed, “Dance Again” in a surprisingly very unflattering body suit. Dim the lights, here we go America. The first person who is safe is Jessica. The next person safe is Joshua. It is now down to Phillip or Hollie. Here we go, time to see who is going home. The last person to take the last spot in the top three and head home for a hero’s welcome is Phillip, he is safe.